Prosperity came to the New World (America) at a price. The Great War was over, and a new era had begun - the Roaring Twenties. Art Deco was at its peak then, and women had shed their restricting clothes and opted for short skirts and shorter hair. Jazz was in. And F. Scott Fitzgerald wrote what many consider the Great American Novel - The Great Gatsby. He died of a broken heart, because the book did not have the following that it does now; but he could never have predicted the reverence it garnered over the years. Nor could he have known that there would be 5 movie versions of the novel within a hundred years. Five is not a large number (our own Devdas has more than 15 adaptations), but The Great Gatsby is not an easy movie to make. How do you visually represent a classic that has a thousand interpretations and is personal to every reader? Earlier versions are either lost, or have been criticised for not staying true to at least one of the myriad references to the chaotic cultural scene of the 1920s (even Francis Ford Coppola's 1974 script, with Robert Redford playing the lead role, was slashed to bits). Say "Baz Luhrmann", and the term "larger than life" comes to mind. This audacious Australian filmmaker is not burdened by the American pressure of "true depiction", as it were. He has gone ahead and directed his own interpretation of The Great Gatsby, and unless you are a stubborn purist, it is impossible to ignore the grandeur of his film. He has stayed true to the basic story, and added his understanding of the characters and the circumstances. The story goes thus. Nick Carraway (Tobey Maguire) is a depressed man, and he visits a psychiatrist (Jack Thompson). Nick is unable to express his thoughts on disillusionment, and the doctor suggests that he write it down. So Nick does that, going back to that summer of 1922, when he was a fresh graduate from Yale. Nick becomes a bondsman in New York, and rents a cottage on Long Island. His neighbour is the mysterious Mr. Gatsby, who throws fabulous parties every weekend. Nick drives across the bay often, to meet his cousin Daisy (Carey Mulligan) and her philandering husband, Tom (Joel Edgerton), who happens to be his classmate. Then Nick gets an invite from Jay Gatsby (Leonardo Di Caprio) to attend one of those parties. Through Jay, Nick discovers a whole new world, that includes actors, flappers, politicians and gangsters, and even meets the rather dubious Meyer Wolfshiem (Amitabh Bachchan). Tom scoffs at Jay's new money, but Nick begins to adore the lonely young millionaire. With a few changes to locations and events, the story is told exactly the way the book is written. Luhrmann approaches the text as a foreigner, and just ups the quotient of glamour and decadence of the decade. He has the perspective of a foreigner, and his movie will appeal to those who have read, but not lived, the Great American dream. The original novel was a warning to Americans - too much wealth and reckless living have a price to pay. The script, too, is a tale of caution. You feel the impending sense of doom the minute Gatsby meets Daisy, for example, but you watch on, helpless to prevent the disaster, and too caught up to move away. Tobey Maguire, who plays a character that goes from happy young man to depressed young patient, is terrific. He is the perfect Nick. Carey Mulligan is a little too lost as Daisy to be the convincingly vain socialite that she eventually turns out to be. Joel Edgerton as Tom is the epitome of male chauvinism and snobbery, and he does a remarkable job. Elizabeth Debicki and Isla Fisher deserved lengthier roles. Leonardo Di Caprio has outshone himself. He is an unlikely Jay Gatsby, but he strikes the perfect balance between self-confidence and insecurity. He is definitely the scene-stealer, but Tobey Maguire gives him stiff competition. 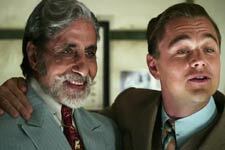 Amitabh Bachchan is in the movie for not more than 3 minutes, and he does not have too much dialogue. However, as Meyer Wolfshiem, he manages to be menacing, ambiguous, suspicious and jolly, all at once. He creates an impact, and even manages a New York accent. Luhrmann relies heavily on grand visuals to move the story forward. Every frame is appealing, even when there is silence. Taking advantage of the art of the period, he adds colours in abundance to show debauchery and self-indulgence, and sticks to pastels when he concentrates on the purity in the relationship that Nick and Jay share. The only splash of colour in Jay's personal life comes from the one indulgence that leads to his downfall - the yellow car. The poorer societies are portrayed in grey surroundings, rotting and vulnerable. The colour palette of the movie is your guide to the mood on screen, and to where the story is headed. Costume and production design are perfect. The only sore point then is the music that the director has chosen to play in the background. Some of it is suitable, like the piano and the jazz. The inclusion of hip hop, though done tastefully, may not seem appropriate in the movie. This is the Jazz Age that he is dealing with, and those finicky about their music may just find it insulting - this superficial approach to the background score. 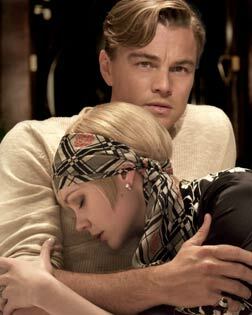 The Great Gatsby is the movie to watch this weekend. It is a little long and winding, and certain parts could have been done away with, of course, but at the end of the day, the visual spectacle is enough to blow your mind and keep it off such little irritations. Do not expect to be emotionally swayed, though. For that, you have to read the book. Be the first to comment on The Great Gatsby (3D)! Just use the simple form below. fullhyd.com has 700,000+ monthly visits. Tell Hyderabad what you feel about The Great Gatsby (3D)!